The Raspberry Pi Foundation has announced several updates for its credit card-sized computer, as well as new profiles that can increase performance by up to 50% by overclocking the single-core ARM11 processor. Owners will be able to choose from one of five set overclocks without the risk of voiding their warranty, with the fastest setting increasing the Broadcom BCM2835 SoC's standard 700MHz clock to 1GHz. 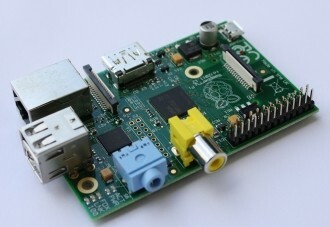 "We are happy that the combination of only applying turbo when busy, and limiting turbo when the BCM2835's internal temperature reaches 85°C, means there will be no measurable reduction in the lifetime of your Raspberry Pi," Raspberry Pi inventor Eben Upton said. Upton said the performance increase is the result of extensive testing to understand the impact voltage and temperature will have over the tiny computer's lifetime. At the highest clock, the Raspi manages a 52% increase in nbench, a 64% improvement in floating point calculations, and 55% faster memory. The highest overclock will depend on each computer and the quality of its power supply. Those who wish to run it at the maximum overclock are advised to give it a good stress test first. Playing Quake 3 is an ideal method of testing the stability of the increased clock. Should the computer fail to run, pressing the shift button while booting will disable the overclock on that particular startup so you can change the setting. Other updates include improved analog audio and better Wi-Fi, which now offers complete driver support for all Wi-Fi devices in the standard Linux tree. Those who wish to use USB Wi-Fi receivers can run Wi-Fi Config to scan and connect to available wireless networks without any additional configuration. Further driver tweaks have increased USB performance by around 10%. All of the new features are available in Debian on the original Raspberry Pi’s as well as the latest revision 2.0 boards after running "sudo apt-get update && sudo apt-get upgrade" to download and install the latest updates.